The jobs are there, and so are the workers - but some of the latter just want no part of the former. A Manpower Ministry report out yesterday showed job vacancies fell by 7,400 last September from the same month the year before. Industry experts, however, are not too concerned about the decline, which they predict will continue into this year. Rather, what has them worried is the fundamental mismatch that persists between the kinds of jobs workers want and the kinds that employers struggle to fill - those with long shifts, odd hours and lower pay, such as security guards, waiters and shop assistants. 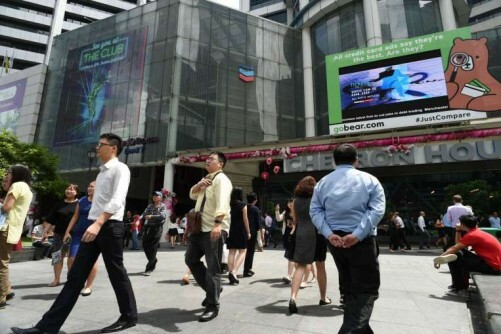 Singapore Business Federation chief executive Ho Meng Kit said of the fall in vacancies: "It is not worrying for now because job vacancies still exceed the number of unemployed persons." He also observed that prior to September 2013, job vacancies were lower than the 60,000 that they fell to last September. "The latest number is just moderating from a high base over the last two years. "For labour-intensive jobs, there is a mismatch as locals shun these. Companies will have to review their value chain of activities, undertake process and job re-design, and pay more for better-skilled workers. To continue relying on foreign workers to fill these jobs is not a sustainable, long-term solution." SIM University senior lecturer Walter Theseira said the aggregate number of vacancies meant little to a job seeker. "The issue here is not the number, it is that people want vacancies in the job that they desire. That's what matters to them." 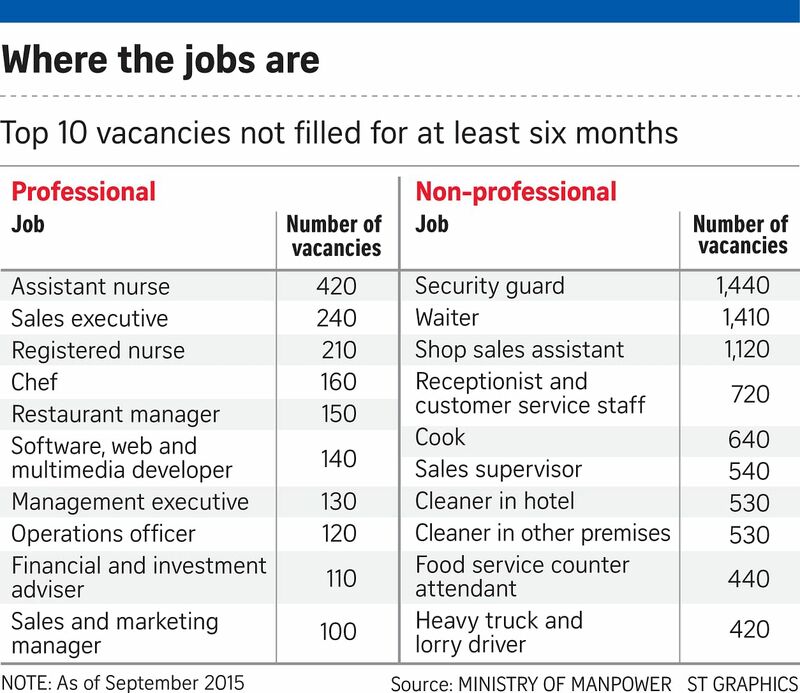 According to the ministry's report, waiters and security guards topped the charts as the professions with the most vacancies - with more than 1,400 positions for each not filled for at least six months. Meanwhile, roles for professionals, managers, executives and technicians (PMETs), chief among them teaching professionals and management executives, made up four in 10 of job vacancies. 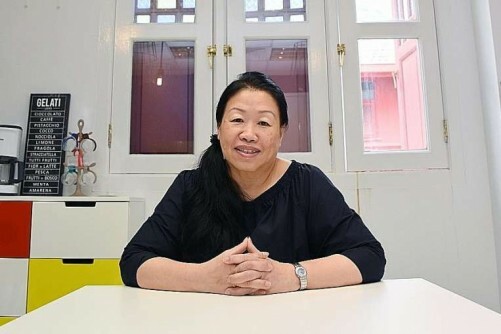 To fill these roles, Kelly Services Singapore vice-president and country general manager Foo See Yang suggested that firms contemplate more flexible workplaces with well-developed social media recruitment platforms. He said: "Workplace flexibility is an important factor for Gen Y, the predominant age group who would be considering these junior PMET roles. Companies can consider redesigning the work scope and offering contract positions to give these candidates the opportunity to try different roles and have varied experiences." As for non-PMET roles, some companies are turning to a blend of technology and higher wages to attract and retain staff. Security firm Soverus, a subsidiary of Secura Group, has cut down its manpower needs by 10 per cent since 2011 by implementing technology such as remote streaming closed-circuit television, video analytics and electronic log books that replace the need for guards to manually take down visitor details. Secura chief executive Paul Lim said it was also important to increase salaries. "We raise wages by at least 10 to 15 per cent yearly for every security officer," he said. Other employers said, however, that technology could only go so far. 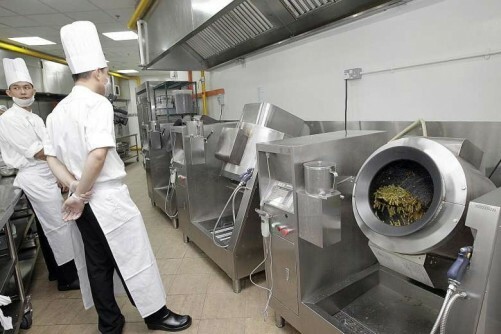 Chef Willin Low, who owns four restaurants including the upmarket Wild Rocket, said robot chefs - like the ones in a new Shanghai ramen shop - were all very well, but restaurants like his need the human touch. "All our expansion plans have been thwarted for the past two years because of manpower," he said. 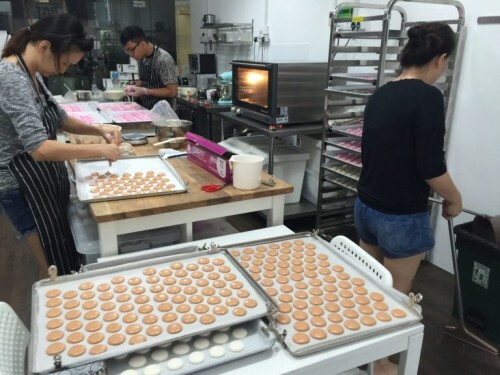 "Nobody wants to work in restaurants because of the irregular hours. I'm at my wits' end."